This tee is your ticket to TI’s party. I guess Queen Bey wasn’t the only artist with surprises up her sleeve. Did you download her album yet? You must, if you haven’t already. Anyhoo, T.I. announced on Facebook he wants to whisk 15 of his lucky fans off to Miami for his Christmas bash on Dec. 20th. The only place in the country that isn’t completely frozen these days. 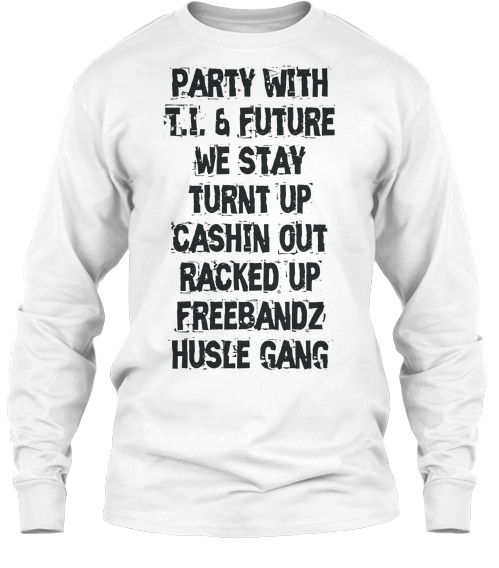 If you’re interested in sitting poolside drinking a Mai Tai on T.I.’s tab *raised hand* please click here and purchase a custom T-shirt from teespring. All sales from the tees will go towards Philippine relief efforts as a result of Typhoon Haiyan. Oh, did we also mention that Ciara’s soon-to-be hubby Future would be attending the Holiday shindig? Speaking of Philippine relief…Rihanna is doing her part with UNICEF to keep support coming to those poor souls. To continue to help Philippine victims and their families through song go to iTunes and download Songs for Philippines.